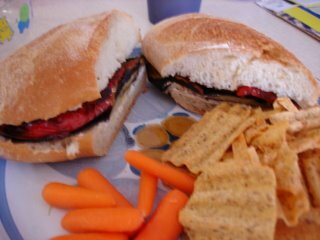 Today for lunch I grilled eggplant and red pepper on the BBQ and placed it on a crusty bun with some goats cheese (sorry vegan friends). We love this in the summer. 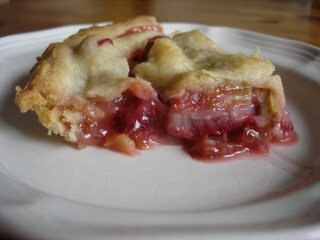 One of my yoga students gave me some rhubarb on Tuesday so I made it into a strawberry rhubarb pie today. This is kind of scary because I am the only one in my house that likes rhubarb! It is delicious to me! Tomorrow is my hubby's birthday so watch out for cake and goodies! mmm.I'm so hungry I could eat both your pictures. Have fun cooking the birthday treats!